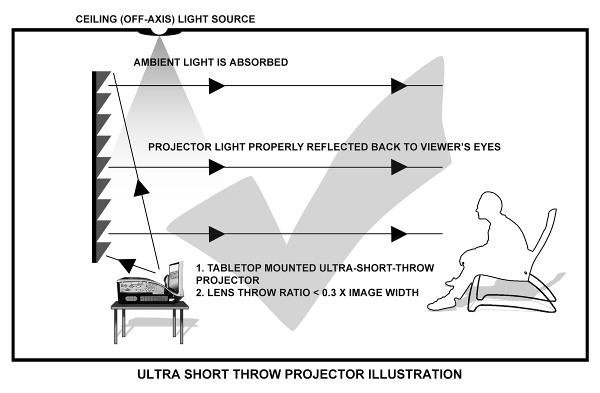 Home News Ultra-Short-Throw Projectors and Ambient-Light Rejecting Screens: Perfect Together? Rodgers says Elite created a special breed of ALR screen designed specifically for use with ultra-short throw and short-throw (ST) projectors. Before getting into the particulars of these new screens, he said it’s important to understand what constitutes a standard ALR or even a “ceiling light rejecting” (CLR) screen, both of which he says are typically made for “long-throw” projectors. The phrase “ambient light rejecting” is used to describe a variety of materials designed to prevent projected video from being washed out by incident room lighting from either natural or manmade sources, Rodgers said. The materials incorporate “reflective microstructures” that either absorb off-axis light or reflect it away from the viewer’s field of vision to achieve an optimal image. 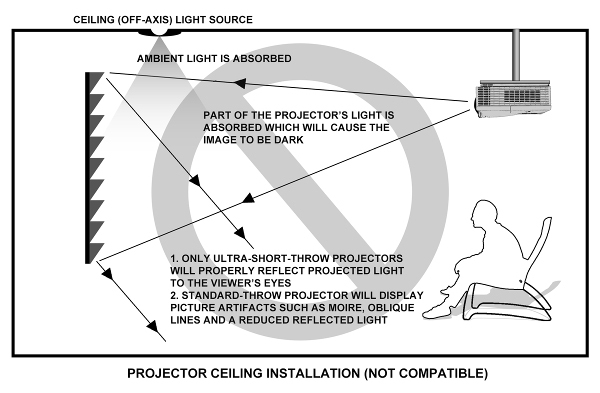 The reason UST projectors “don’t work” with garden-variety ALR material is because a UST projector spreads light over a relatively short distance, which means much of the light is off-axis to the screen and, consequently, rejected by the ALR material, Rodgers explained. To achieve “optimal picture performance from UST projectors,” Elite designed a screen with a reflective surface comprising an “angular serriform” structure (shown in the diagram below). That serriform structure is central to screen materials such as Elite’s StarBright CLR in which those reflective microstructures are aligned to divert light spreading upward from a UST projector directly into the viewer’s field of vision (as illustrated in the diagram below), Rodgers explained. At the same time, these specialized screens reject other forms of off-axis light, including regular room light, window light, and, especially, ceiling light. The reflective surface even directs light from a “standard throw” projector away from the viewer’s field of vision, he added. Those screens are specifically designed to divert any light from above away from the viewer — it doesn’t matter whether that light is coming from a ceiling-mounted projector or a light fixture. In theory, a screen using StarBright CLR material could be inverted for use with a ceiling mounted UST projector, but Rodgers said it’s unlikely that such a setup would align properly with the human eye to achieve “sweet-spot” performance. For more on Elite’s ambient- and ceiling-light rejecting screen materials, visit elitescreens.com. Dave Rodgers is marketing director at Elite Screens. He has worked in the audio/video and wireless communications industries for more than 20 years. How Do Ambient Light Rejecting Screens Work?